Bring French regional cooking into your own kitchen. 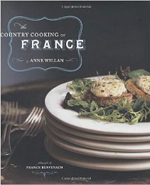 The Country Cooking of France, (Chronicle Books, 2007) takes you on a culinary journey through the traditions of the many distinct gastronomic regions of France. Recipes range from time-honored favorites like Le Cassoulet de Toulouse to contemporary Crêpes au Caramel et Beurre Salé. The book is full of wonderful photos of the recipes, markets, villages and ingredients that make rural France special and make this book as beautiful to look at as to cook from. I am planning a week’s visit to Paris with my daughter (28) in February to celebrate life and her graduation from NYU with a masters degree in Occupational Therapy. We both love to cook and eat good food. Can you suggest any one day cooking classes we could take while there? Or, any favorite eating spots or markets? Yes, talk to Jaques Bal. He is a good cook with excellent classes.